Imagine watching one of your dreams unfold and come true. On May 5, 2012 I watched the “pomp and circumstance” of ABC University’s first graduating class since the civil war. I was indeed a proud mother, since I had taught each one of the graduates at least one time and the education students multiple times. Over 800 chairs had been set up in the arena for attendees. I laughed and said, “There is no way that we would have that many people attending.” Why was I so skeptical – for many reasons. One is that the road to Yekepa is difficult to traverse and we were entering the rainy season. Another reason is that most people do not have vehicles to drive. You either walk, take a motorcycle, an overly crammed taxi, or ride on the top of an already loaded truck. Besides, all of this takes money and many people have little money. I knew that it would take most graduates’ family members a day or two just to reach Yekepa and then where would they stay? How would they eat? All odds were against so many people attending. Families come to celebrate their loved one’s graduation. Imagine my surprise when the people kept coming and pouring into the building. We had over 1,000 proud family members and friends attend. We ran out of chairs. People were standing in the back and overflowing to the outside. It was a joyous occasion! The arena was packed with family and friends. I asked one of our graduates how she enjoyed the graduation. She smiled as she told me that her daughter had said it was one of the best events that she had ever attended and that it wasn’t even too long. I was a bit surprised by the last part of the statement, because it was 2 ½ hours long and I was about to have a heat stroke in my regalia. Once again I was reminded that we Americans are quite impatient and do not suffer discomfort well. Talking with Dr. Slawon who is Executive Director National Commission of Higher Education and Sharon Rechienbach a visiting professor. 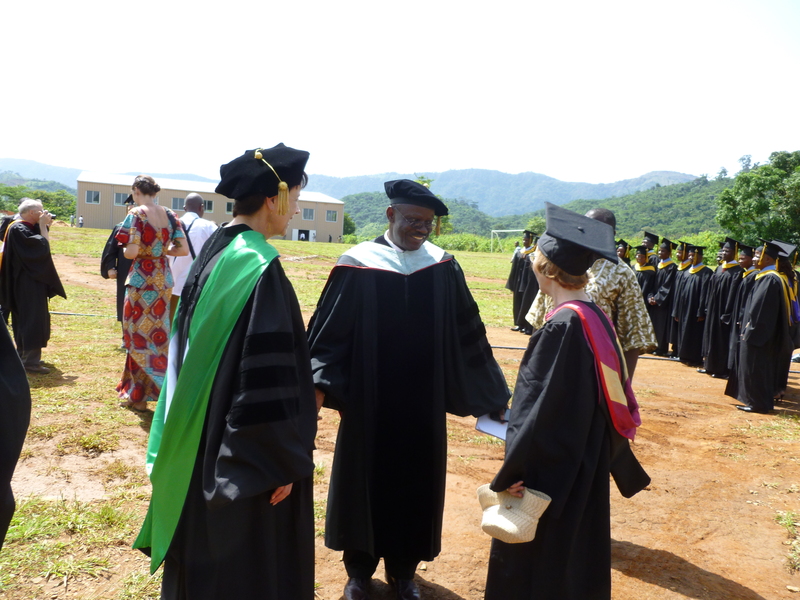 I was in my regalia for 4 hours and nothing like standing in the hot African sun with it on (notice I am still whining:-). Perhaps this will help explain why families and friends were willing to travel so far under such tough conditions. 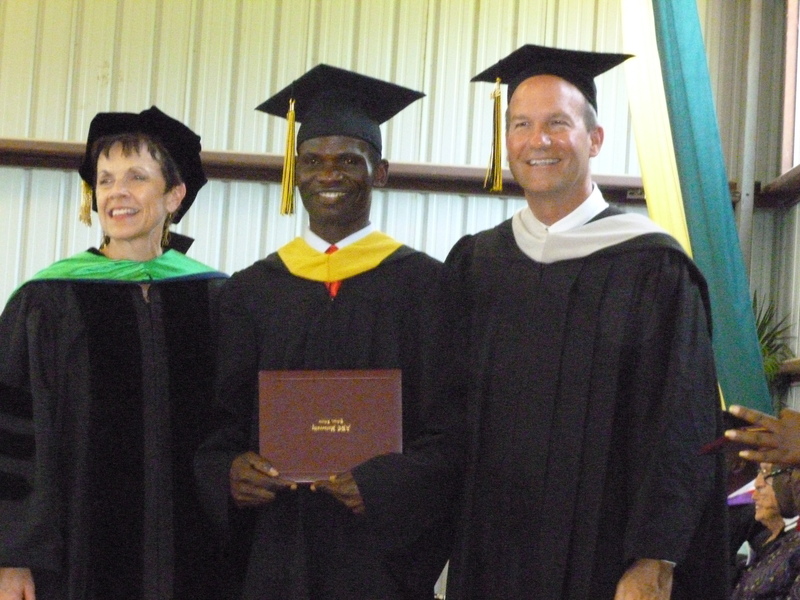 Having a bachelor’s degree in Liberia is indeed an accomplishment. According to the 2009 report of the Assistant Minister of Gender and Development, of adults age 15-49 years old, only 18.9% of men and 7.7% of women have completed high school or higher. So kudos to ABCU graduates who persevered and made it through the four years. 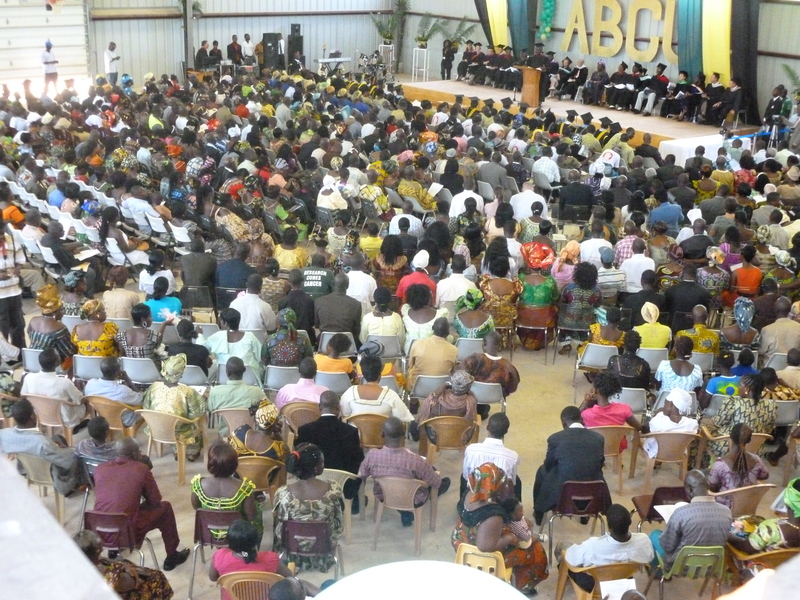 It was not easy because most of them had read few textbooks before they came to ABCU. Yet once they were on campus, they were expected to read college level texts and do college level work. Needless to say their freshmen year was extremely stressful as they tried to adjust! How blessed I was to see their and my dream fulfilled as they walked across the stage and I was able to hand them their diplomas. Against all odds – Zephaniah was a child soldier and now he is a leader in his community and is determined to make a positive difference in education. Honorable Etmonia Tarpeh, the Minister of Education was the guest speaker. My education students were thrilled. The Minister of Education talked about her traditional engagement to a high school teacher. She did not want to be engaged nor married, so she talked her grandmother into first letting her go to university. When she completed her university studies, she was able to break the traditional engagement and go her own way. Madame Tarpeh challenged the audience to make education for females a priority. She challenged the ABCU faculty to raise up teachers in a country that is desperate for qualified educators. 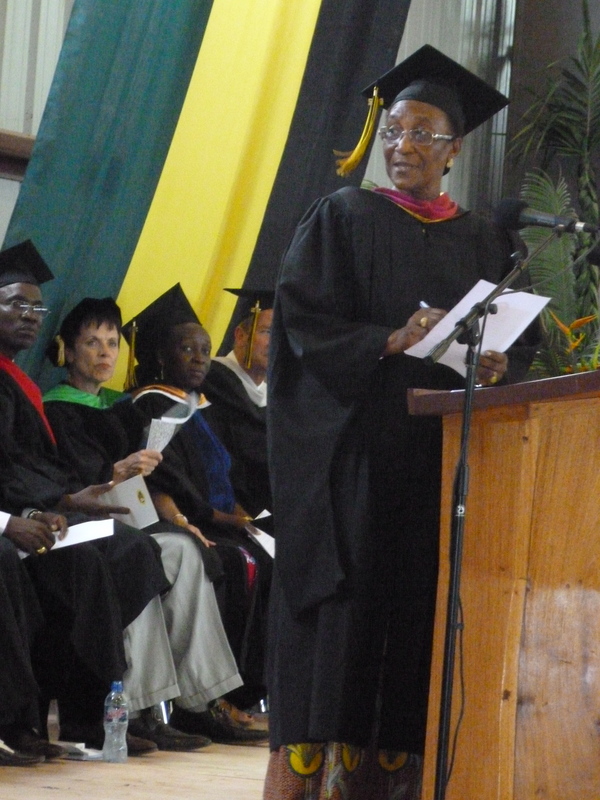 And she challenged the graduates to go forth and make a difference in the lives of their students. Traditional Mano tribal singers present a number. 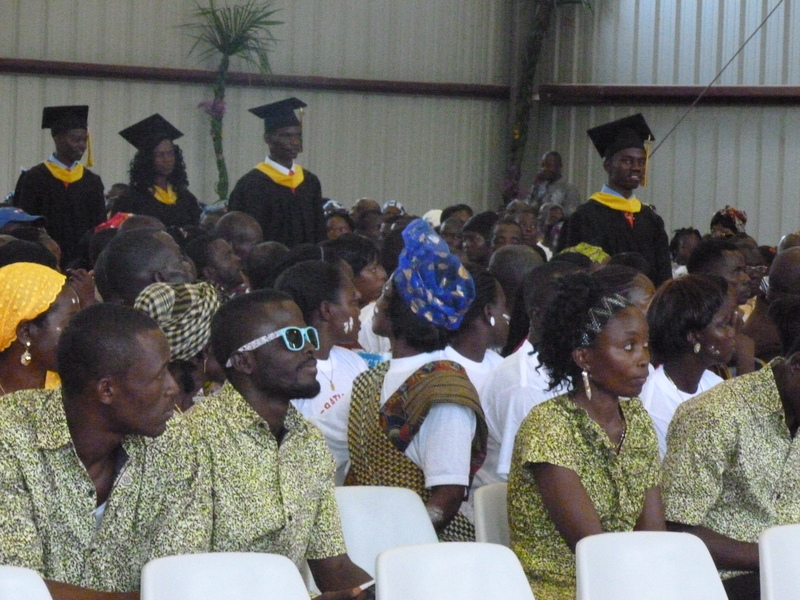 Many of the graduates, but not all, were from the Mano tribe. Though we do not focus on one tribe or another at ABCU, it was important to blend the traditional with the modern. 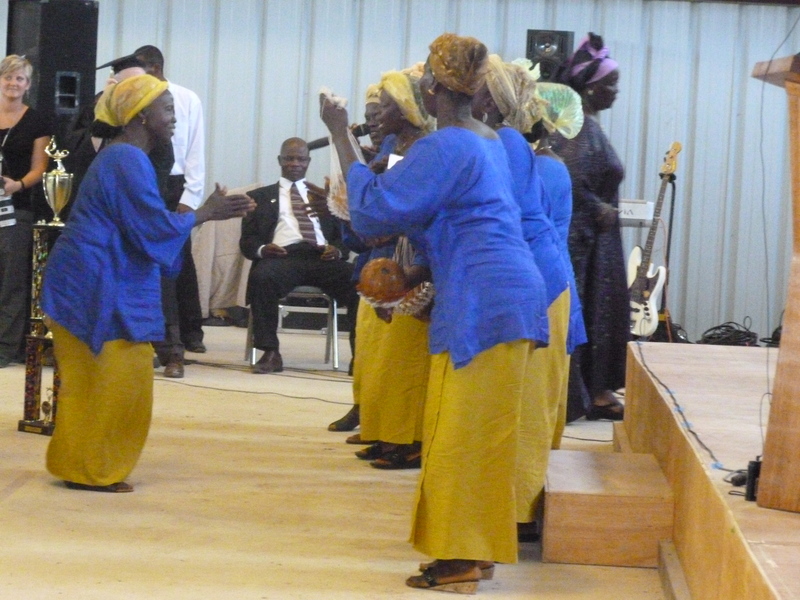 So, we invited the traditional singers from the Mano tribe to present a song of thanksgiving. It was indeed a joyous day. 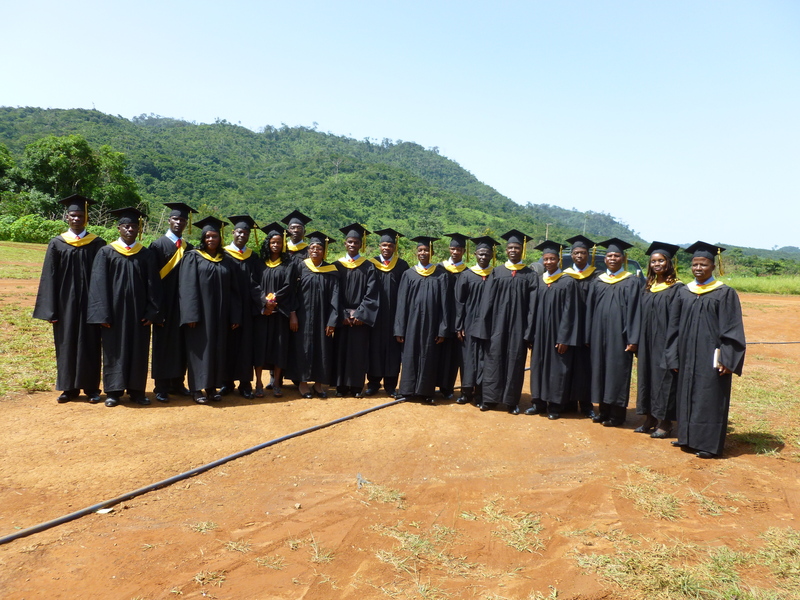 And now drum roll please…may I present to you the ABCU’s graduating class of 2012! The graduating class of 2012. Praise to God for allowing me to be a part of such a wonderful event. Halleluhia! What a wonderful and exciting event. God sure is at work isn’t he!?! Thanks Patty – you never know how God is going to use us. Once you get that nursing degree, the sky is the limit! What amazing joy and pride and gratitude you must be feeling, Vicki! Thanks for sharing this. You are doing Kingdom work! God bless you and John, too. Thanks Debbie, the four years went by so quickly. I am often amazed that God could use someone like me – it just goes to show He can use anyone. I am collecting a bouquet of kind words from people like you and will give them to God in praise for His goodness. Vicki, The graduation is so exciting. Praise God for his provision. I’m so glad you were able to be there to participate. How did all of those people find lodging and food and transportation? What a significant event! I am still not for sure where everyone stayed and found food. Thanks George for your words of encouragement. We have worked hard at offering these students programs that will prepare them for the 21st Century and that will bring glory to God’s name. At times I think we almost pushed the students beyond their limits, but they persevered and I am so proud of them. Vicki, thanks for including me in this email! What you shared has been on my heart for days. I am so eager for us to work together on future endeavors for your students. I am praising God for your work, the students, and their futures. Vicki, I am so glad you included me in this news, What you shared has been on my heart for days and I have shared the wonder of it all with several people. I am so eager to work with you and your students in the future. Praise God for your work, for the students, and for their futures. AMAZING Vicki! Brings tears to my eyes! So proud of you- YOU are a difference-maker and are truly using your God-given gifts to benefit others! As you know Heather, it is a privilege to be an educator b/c we have the chance to touch other’s lives. What JOY you must feel, Vicki !! The heart of God is even more proud than these family members and students are. He saw the potential in each student before they even began their studies. How humbling to have been used the bring about God’s will in their lives. Nancy, your words are so true – it is humbling. I think of how these students have overcome such unbelievable challenges to get an education. It continually reminds me how much I take for granted.